With Inspiration Week around the corner, I am excited to share an amazing project put together by the delightful Erin at Design For Mankind. (I just love her, she’s great!) Erin has developed an e-zine full of amazing inspiration from fellow bloggers, artists and designers! Best of all, you can download it for FREE! Yes, FREE! So, download and enjoy! And let Erin know how much you appreciate her free gift to all of us! Click here to download all twenty pages of inspiration. Don’t forget Inspiration Week begins right here on Monday with some special insights on Living A Beautiful Life from none other than…. In other news, Friday is National Wear Red Day, in support of the fight against heart disease in women. Visit their website to find out more about how you can donate to this worthy cause. In addition, Traditional Home magazine wrote to me and asked if I would pass on the word to you about their Really Really Red Auction to support the same effort, so click here to see what you can bid on for a great cause. PS. Friday is the last day on my blog to enter the giveaway for a great book, so if you haven’t yet entered, click here. Styling a coffee table is sometimes a tricky task. You don’t want your tables to look cluttered, but it is a nice touch to have a few attractive items to add to the ambience of a room. 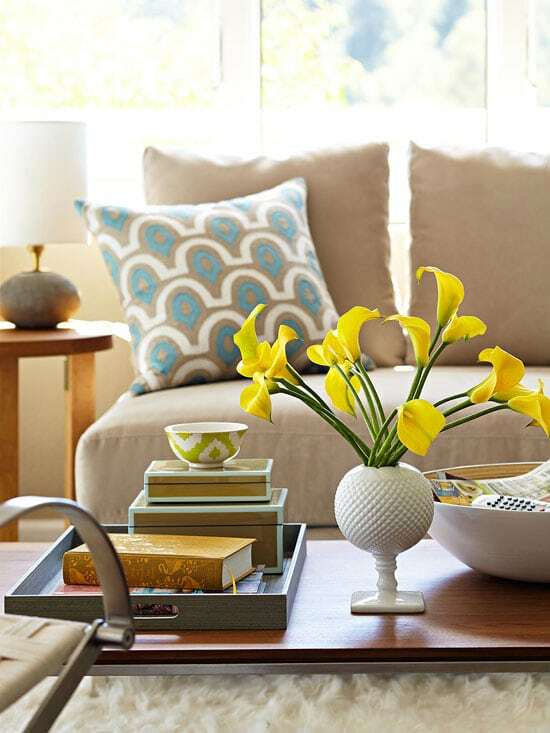 A coffee table is a real focal point, so use it as an opportunity to have a little fun with styling! To prevent the room for becoming overly cluttered or decorated, don’t style every table in a room with decor. If you want to style your coffee table, perhaps leave an end table clear. I saw a great post on Neutral Dwelling and it inspired me to think about coffee table styling, so I thought I’d share the concept here. Try unifying different shaped objects by using items of the same color. Three different shaped vases all in blue, for instance. Create interest with items of all one color by using different textures. Try opposites: pair smooth with rough, shiny with dull, old with new, round with square, organic with man-made. Vary the heights so that each object is just a little bit shorter than the next tallest item. This keep items from feeling disjointed. Make sure objects are not all too small. Choose at least one bolder item to be in focus. Use books or pedestals to elevate items that seem too short. Use a basket or tray filled with a collection of items: maybe books, fruit, artichokes, seashells, vintage toys, games or buttons. Interesting conversation pieces are wonderful for coffee tables, we use carved wood instruments and attractive wood or vintage game boards. Do double duty! Corral remote control clutter with pretty bowls or baskets. Leave plenty of room on the table for actually using the surface for something other than display. If you don’t leave room for a coffee cup, the table will appear awkward and will not be useful to you. Make table tops pretty & useful! Make sure your tablescape looks good from all angles. You can use just one item on your table, such as a piece of pottery or a vase, but make sure it isn’t tiny! Wide and bold would be a better choice than tall and skinny. When you look at magazines, focus in on coffee table table-scapes you like and duplicate what you see with your own items of similar size and shape! 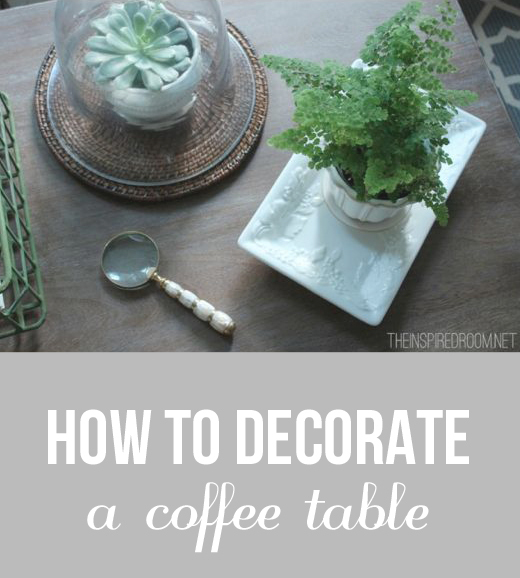 Check out these four easy tips for decorating a coffee table! For more decorating tips, check out the How to Decorate series!